Being a mild germophobe, I made sure to wipe clean my new cube using (what else?) 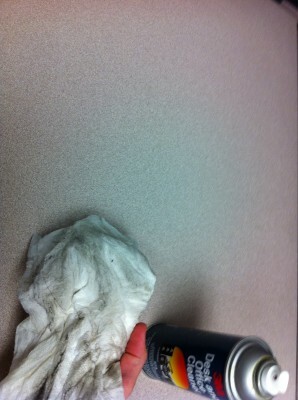 3M Desk and Office cleaner. Even though everything seemed perfectly clean, a vast amount of dirt came out. Hi-tech filth, after pass two. This got me thinking about how brilliant the designers of the modern office are. They make them look clean regardless of the amount of dirt being hidden in plain sight. My theory is that the country’s top camouflage designers working for the army eventually run out of things to do and go on to tackle a harder challenge: Making the workspace of an engineer look clean. See the difference? I didn’t think so. 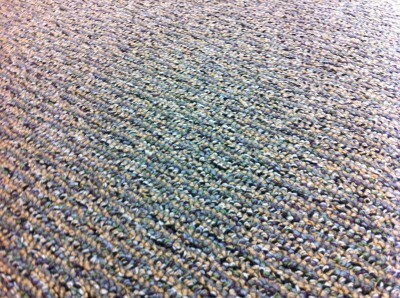 Even more striking is the design of office carpets. These patterns will hide anything smaller than 3/4 of an inch. Drop a penny, an earring, a screw and you will never find it again. Never. 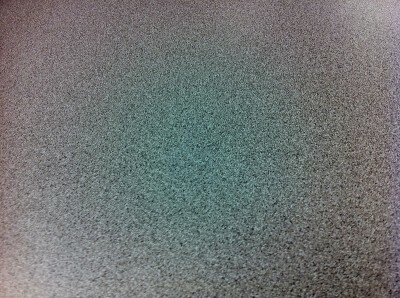 Other things, such as giant coffee stains are completely hidden from plain sight too. See the photo below. Can you spot the giant coffee stain? Can you spot the coffee stain? Jajaja! nuestros cubículos son un asco. Afortunadamente nos hacen mover cada 2 años y así tiene uno la oportunidad de heredar el cubículo mugroso de otro ingeniero. Y ni hablar de los teclados y ratones de las máquinas de pruebas. ewwwwwwwwww!!! Usar el teclado de otra persona…. ewwwwwwwwwww!! !